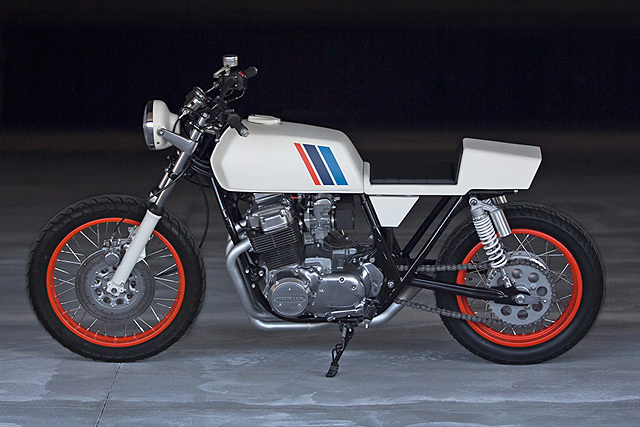 Not one to do things by halves, Gaige undertook a full frame-up restoration to ensure the ‘77 Honda was in better shape than when it left the Honda factory. This is not a bike built by bolting a few choice parts on. It was taken back to the bare frame; then every nut, bolt and part was disassembled and inspected before being rebuilt or replaced and painstakingly pieced together. Many unwanted parts would never find their way back onto the bike and those that did had to be perfect. The frame was detabbed and painted black, any exposed metal polished to a mirror finish and all fabricated parts redone till they were just right. 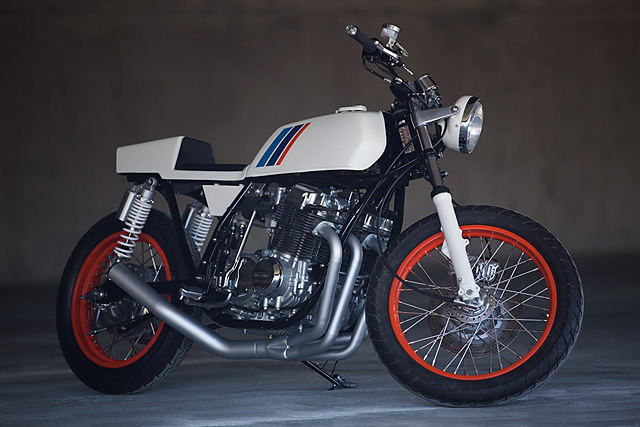 With the CB series Honda’s sporting some of the best known fuel tanks in the custom scene, it was a bold move when Gaige decided to swap his out for a ‘76 Yamaha XS500 unit. But sticking to his design brief required more angular lines and that is exactly what the XS item offers. Gaige took his time getting the tank mounts just right before turning his attention to the unique and angular oil tank that many would believe is a battery box. The seat maintains the theme but refusing to waiver on the design, it took four goes to fibreglass it just right having used a cardboard mock-up and fibreboard mould. With the fabrication work done, it’s the paint work that really brings the BMW Motorsport look to life, the white is straight from the equally angular E30 M3 DTM race cars of the ‘80’s while the classic M Sport colours have been applied to the tank. Blue for BMW/Bavaria, Red for Texaco (a then partner of BMW Motorsport) and the BMW Blue Violet a symbol of the two companies hugely successful partnership. The stainless steel respoked rims also copped the Texaco red, looking resplendent as they work in unison with the fully rebuilt and white-painted front forks and the remote canister rear shocks with BMW white springs. 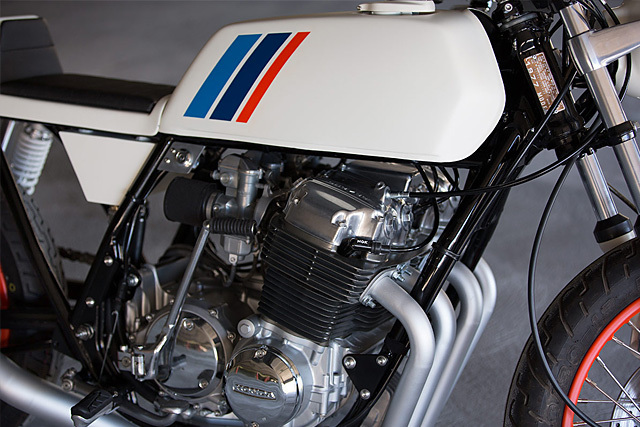 The DTM cars of the Eighties were minimalist but precision perfect and Gaige made sure the running gear of the CB750 was exactly that. The engine is bored and fitted with new pistons, pins, rings and clips to give faultless operation. 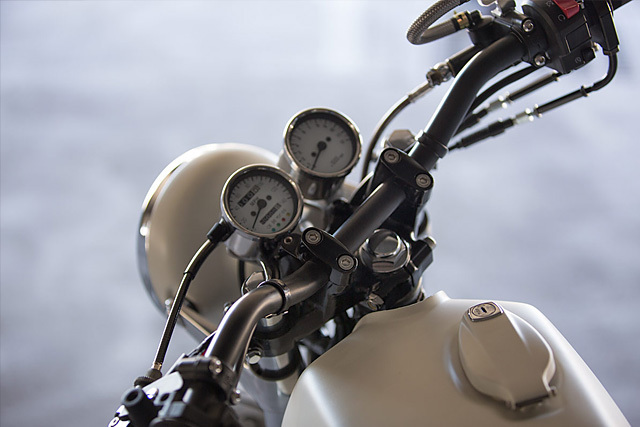 The rejetted carbs breathe through pod filters and the engine exhales its spent gases via a beautiful Yoshimura style 4-into-1 exhaust that is internally baffled along the way. Even the presentation of the engine is race car perfect, heavily polished valve and side covers, repainted barrel and block, even the speedo and tacho drives are immaculate. Having spent so much time ensuring the bike was rebuilt with new or perfectly reconditioned parts, Gaige wasn’t going to rely on a 40-year-old wiring loom; so the bike is completely rewired, the battery hidden in the tail-piece and all the components and connectors replaced with new items. 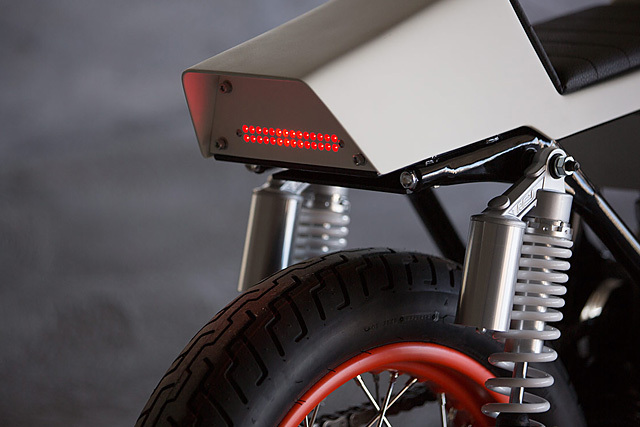 The headlight is traditional but the tail light is anything but, a collection of tiny red LEDs warn followers the CB is slowing while carefully placed miniature LEDs in the frame and bar ends take care of the indicators. 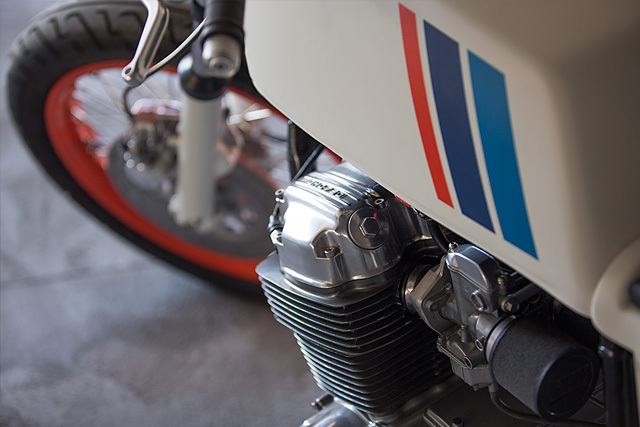 If the BMW of yesteryear had been looking for a bike to join their race cars in the pit paddock, Gaige’s custom café would have been perfectly suited. 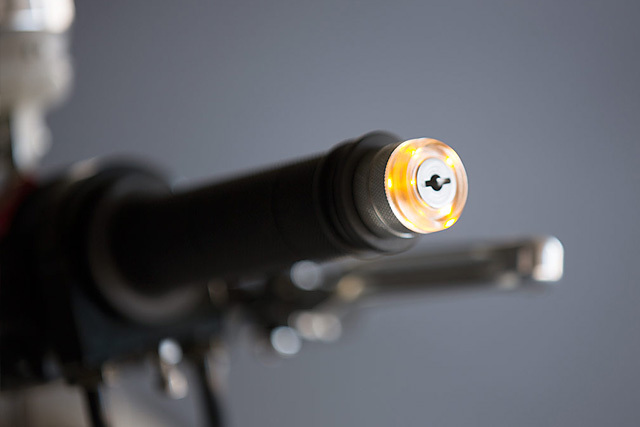 It’s built with German-like precision right down to the last bolt. It has the aggressive Bavarian look with the ‘in your face angles’ and the M Sport motif is a thoughtful tip of the cap to one of the best damn looking race cars of the era.